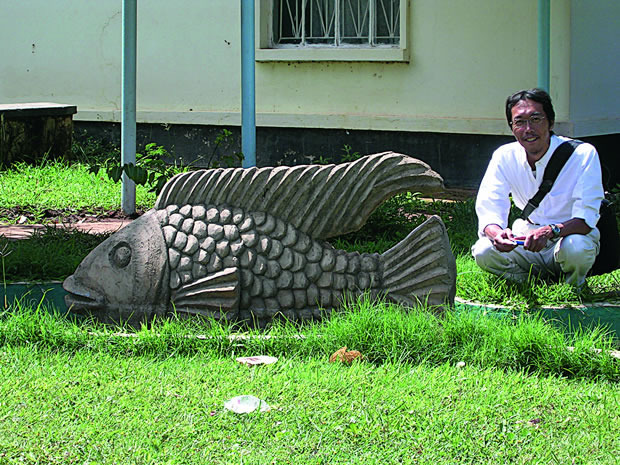 Dr Tetsumi Takahashi is a biologist from Japan who works on the taxonomy of Cyphotilapia and other Lake Tanganyikan cichlids. How many Cyphotilapia are there? There are currently two valid species: C. frontosa and C. gibberosa. C. frontosa has two scale rows between upper and lower lateral lines. It is found in the northern half of Lake Tanganyika and contains six and seven-banded morphs. The seven-banded morph is known only from Kigoma, while the six-banded morph is distributed through the other regions of the lake. C. gibberosa has three scale rows between upper and lower lateral lines. It is found in the southern half of the lake. Has Cyphotilapia gibberosa been accepted as a species? Scientific names don’t necessarily represent ‘biological species.’ In the case of Cyphotilapia, nobody checks the species status of C. frontosa and C. gibberosa based on the ‘biological species’ concept and that is the most popular species concept now. However, I think different scientific names should be used for these fishes. It will be better practically, for example, as an estimation of biodiversity of Tanganyika cichlid fish. What about the six and seven-banded forms of C. frontosa? Six and seven-banded morphs are separated by number of vertical bands on the body side of C. frontosa. I could not find any morphological differences between these morphs. According to the standard of taxonomy of Lake Tanganyika cichlids, these forms are not different species, but are just colour variations within a single species.